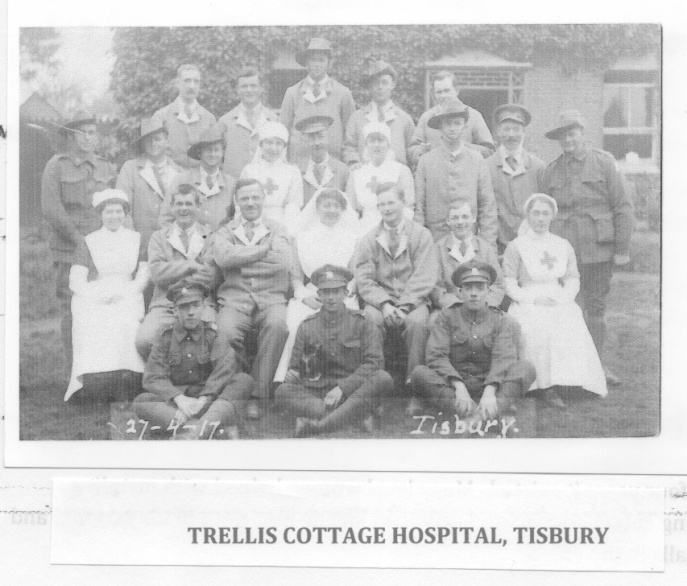 Elsie nursed as a VAD at Trellis Cottage in Tisbury from May 1915 till 1919 when the hospital was closed. She came from Ridge Farm where her family lived. As some of the young girls did, she fell in love with one of the Australian soldiers who was recovering at Trellis Cottage. When the war finished and her fiancé was to be repatriated to his home on the other side of the world her family were loathe to lose her so the engagement was broken off and she stayed behind when he sailed away. Later she married a neighbouring farmer’s son and lived the rest of her life in Fonthill Bishop close to Tisbury in south Wiltshire. Trellis Cottage Hospital – Elsie is in the first standing row, fourth from the left. This story was donated by Margaret McKenzie of Fovant History Interest Group. Find more about Elsie’s experience as a VAD at the Trellis Hospital here.